I have always been told taught that Enoch had such a strong faith with God that one day the two went for a walk and Enoch never came back. This conjured up the image of Enoch waiting at the white picket fence for God to come down the sidewalk. Upon his arrival, He & Enoch would go for a daily walk around the block. Then one day, when it was time for Enoch to return, God asked if he wanted to keep walking. Enoch replied, “Yes” and never returned. You have to admit it was a nice little image…until the day God showed me differently. God showed me in my life, it is not me waiting at the gate each day for Him to come down the sidewalk. Instead, it is He is waiting at the gate for me. See, the reality is my Loving Father has a special piece of His day carved out to walk with me. That is correct, the God of the Universe has a place in His calendar every day for me! Are you an “Enoch”, treasuring and cherishing your walk each day with God? Or are you, like me on many days, giving up something so precious without a second thought? "But the LORD hurled a great wind upon the sea, and there was a mighty tempest on the sea..."
Pastor Tullian Tchivdjian in Surprised By Grace states, "Would it have been better for Jonah if God had left him alone? No, it would have been far worse. It was an act of mercy for God to send the storm." We normally do not see the storms in our life as an act of mercy but this is exactly what my Savior is showing me. The last 6 months has been filled with ups and downs, which took me to places that I had never experienced before. The reason for the ups and downs…disobedience. Jonah's story had disobedience also. Jonah fled physically from God. My fleeing came without me ever leaving where we had lived for 13 years. God sent my family to NC in 1999 as missionaries. Our church in VA sent us with their blessing to an area where we knew no one. Throughout those 13 years, my family was blessed to work with independent Christian bands (some who have even gone on to bigger things) and see God move in many ways. One was my own salvation. We became active members of a local church body & other ministries in our area. My duties included Sunday morning bible study teacher, media director, deaconess, teacher for CCF, leadership in a prayer group, & GROW Team member to name a few. During these years, I was blessed to work at two different Christian retail stores & coordinate multiple Christian events. Then one day, my darling sweet hubby came to me and said, "God wants us to move." My response, "Are you kidding?" We were settled and God was using us for ministry. The thought of asking God to confirm what Sweetie said was the furthest thing from my mind. Without my knowledge this began my fleeing from God spiritually. Needless to say, this blogger is one of God’s more stubborn children and it took a major crisis and a ‘great’ fear to get my obedience to His simple request given to my Sweetie, “It is time to move.” My prayer is this stubborn child will not be so stubborn in the future. Even with all that has happened, as I continue my walk with Jesus, I will hold firm to the fact that Jesus has my best interest at heart. He knows what I need not just what I want. My prayer is that I will want what I need. "The hardness of God is kinder than the softness of man, and His compulsion is our liberation"
Have you seen the above bird before? What is he? He is mistakenly referred to as a 'weird' duck on occasion. 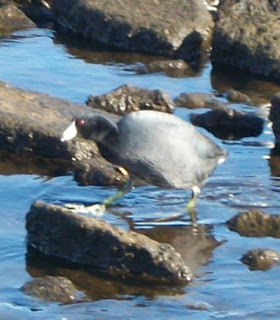 Nevertheless, this is not a 'weird' duck but an American Coot. The coot has the ability to live with ducks. While we lived in NC, it was a pleasure of mine to be able to take photos like the one above at Union Point Park. Our park had 4-5 coots that lived part of the year with the ducks. 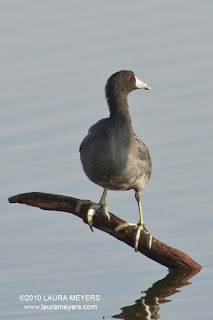 The coot is a waterfowl bird yet, not a duck. He has a triangular beak and non-webbed feet (chicken-like features). Yet, to watch him at the park, it becomes evident he thinks he belongs with the ducks. Is it because everyone likes the ducks and feeds them and he will be able to have a meal? Most people at the park treat him no different than the ducks. However, he and his siblings were the ones that I was attracted to the most. God has been ruminating this simple devotional with the coot for multiple months. The ironic thing is as mentioned before "Simple does not equate to easy" (A line from the family movie, What If). The ability the coot has to be mistaken for a duck and blend in with them has several spiritual applications. 1. Where am I being mistaken for something that I am not? 2. How often can I blend in & look no different than my surroundings? Take time this week to ponder those questions. My journey this week has been "hurry up & wait." As the Father is revealing pieces to me, it is apparent that He wants me to be willing for Him to do it in His timing not mine. I jokingly told my Sweetie this week; "Apparently one of us has not learned our lesson in patience yet!" This is how our week has played out. Doc has test done, we wait a couple days for results. Go visit doctor. New information is revealed…this in turn is immediately followed by the instructions of more tests. Then we must "wait patiently" again for the test results. What does this have to do with my walk with God? Everything at this moment for God is teaching me that my one word for 2012, "focus" has multiple facets. This week’s facet has been where exactly is your focus? I have told people numerous times, while in ministry for the last 13 years, that Jesus needs to be their focus. While this is a true statement…He is to be our main focus; we can even mess this up royally if not careful. Have you ever found yourself in a conversation, except while focusing on the person you lost total track of what they were saying? This happens to me a lot…I believe that as we walk with Jesus, this happens to a lot of us. We concentrate so hard on being totally focused on Him, that we completely miss the lesson being taught. It is becoming evident to me insights will only happen if I am focusing on both the words being spoken and the Speaker. There have been countless times that I have been in a study or even taught one in which the content has not sunk in. It is embarrassing to admit such a thing but it is the truth. Not sure exactly when it happened, but evidently I have been focusing on the Speaker and not listening to the words He is speaking. Hence, the question becomes, “How do we avoid this?” Any suggestions? I am still learning and don’t have the answer…yet. A crazy week...from hubby traveling to me having bronchitis. Yet, through it all God is still slowly teaching me about my one word: focus. God is using my hobby of photography to show me "focus" also. My Aunt is teaching me how to use the manual settings instead of the automatic settings. As we were cropping some of our shots, I noticed that some would get grainy and blurry. She asked me what was my ISO and F-stop setting on the shots. Then she told me if I want to crop and see the small details of a picture it is important to remember "slow shows" when adjusting settings. God revealed a spiritual truth to me in her statement...that to see and really understand something we must be willing to go slow. Wow...that stings for those of us who want to learn the lesson and move on. See. if we only speed by something (whether a bible study chapter, bible reading, conversations, looking at a picture, etc) when we go back to better understand it will be grainy and blurry, just like my pictures were. Without looking back up at top what was in the picture? Now, go back up and look to the right of the big tree near the edge of the photo in the background. Thanks to my aunt and teaching me "slow shows" I saw the cross. Special "Shout-Out" to Rachel Olsen (http://www.rachelolsen.com/) who has been an encourager and reminding me that I have a whole year to learn about focus. I have been following Twitter (http://twitter.com/DawnWhitmore) and am amazed at the bloggers on Twitter. There are some people that have a new blog at least three-four times a week (some even more). It astounds me that the ideas keep flowing for these bloggers. 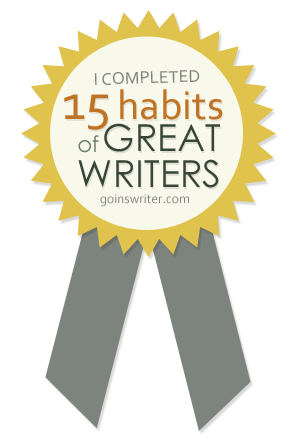 It makes my goal of getting a new blog for Dawn’s Dialogue out once a week and a another out for The Five C blog once a month seem puny. These people have full-time jobs and still get so much writing done. Plus, they are able to post on all of their social media sites too. It would behoove me to figure out their secret. Of course, trying to understand and learn about focus is what I have been concentrating on this past week. Which some of you may remember is my one word (www.myoneword.org) for 2012 mentioned in my last blog. Therefore, even though I am definitely not in the league of my Twitter peers...with God’s leading and encouragement the blogs will continue to come. Where is your focus? Today is February 2nd and many people have long forgotten their New Year Resolutions. However, for a group of people (myself included) the year didn't start with a resolution. Instead, we decided to ask God to reveal a word, one specific word (myoneword.org), that He wanted us to concentrate on for 2012. As I mentioned in previous posts, my word is "focus"and wired the way I am; I grabbed my laptop and typed a Google search on Scriptures on focus. My intent was to find a scripture with the word, focus, in it. Well...my plans have not gone as planned. God has confounded me so far with my word. What I realized through this little exercise, God wants me to concentrate on this word for all of 2012. This may seem a simple thing to you, yet for me it became rather profound this week. While reading Experiencing the Resurrection, God is showing me "Don't be distracted by success. Don't find your joy in accomplishments. Don't find your identity in the thing you do....Instead rejoice in the fact your name is written in Heaven!" With my temperament and personality, I approached my word with the desire of having of accomplishing (actually conquering would be accurate) the meaning, definition, and experience of my one word already. Did I mention that it is only been NINE days since God revealed the word 'focus' as my word for 2012? God is revealing to me slowly but surely that He isn't working on my time table. He wants me to learn focus in His timing not mine.